This medication must not be used in children younger than 12 years due to an increased risk of serious side effects (such as extremely high blood pressure). Also, this medication is not recommended for use in children between 12 and 17 years old. Studies have not shown it to work in children in this age group. 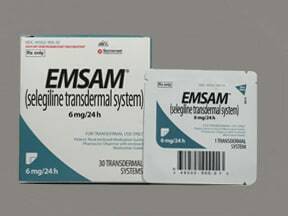 Who should not take Emsam Patch, Transdermal 24 Hours? Selegiline is an antidepressant (monoamine oxidase inhibitor) that treats depression by restoring the balance of certain natural substances (neurotransmitters) in the brain. Selegiline can improve your mood and feelings of well-being. This medication is a patch for use on the skin. Read the Medication Guide available from your pharmacist before you start using selegiline and each time you get a refill. If you have any questions, consult your doctor or pharmacist. Follow the package instructions for using this medication. Make sure you understand how to apply a new patch and dispose of the used product. Do not cut the patch into smaller sizes. Do not use the patch if it appears broken, cut or damaged. If you have any questions, consult your doctor or pharmacist. Before applying the patch, wash the area you will be using for the patch gently and thoroughly with soap and water. Rinse and dry with a clean dry towel. Do not apply the patch to hairy/oily/red/cut/irritated/broken or scarred/calloused skin. Remove the patch from the foil pouch and apply as directed by the manufacturer. Apply one patch to an area of clean dry skin on the upper body (torso), upper thigh, or on the outside of the upper arm where it will not be rubbed by tight clothing. Change the patch daily at about the same time each day. Apply the patch to a different area on your body each time to avoid irritation. If your patch falls off, apply a new patch to a new area and continue on your same schedule. Be sure to remove the old patch, fold it in half so it sticks to itself, and throw it away out of the reach of children and pets. Do not touch the sticky side with your fingers. Wash your hands with soap and water after handling the patch. To reduce your risk of side effects, your doctor may start you at a low dose and gradually increase your dose. Usually, your daily dose will not be more than 12 milligrams. Once your condition improves and you are better for a while, your doctor may work with you to reduce your regular dose. Follow your doctor's instructions carefully. Do not apply more patches or leave the patch on for longer than prescribed. Your condition will not improve any faster and your risk of side effects will increase. Use this medication regularly in order to get the most benefit from it. To help you remember, use it at the same time each day. It may take several weeks for the full benefits of this medication to be noticed. Do not stop using this medication without consulting your doctor. What conditions does Emsam Patch, Transdermal 24 Hours treat? Dizziness, drowsiness, redness/irritation at the application site, tiredness, weakness, problems sleeping, constipation, and dry mouth may occur. If any of these effects persist or worsen, notify your doctor or pharmacist promptly. Tell your doctor right away if you have any serious side effects, including: fainting, mental/mood changes (e.g., agitation, confusion), muscle stiffness/twitching, changes in sexual ability/interest, shaking (tremor), shivering, swollen ankles/legs, unusual weight gain/loss, eye pain/swelling/redness, vision changes (e.g., double/blurred vision), severe stomach/abdominal pain, persistent nausea/vomiting, seizures, dark urine, yellowing eyes/skin. This drug may rarely cause an attack of extremely high blood pressure (hypertensive crisis), which may be fatal. Many drug and food interactions can increase this risk (See also Drug Interaction section.) Stop using selegiline and get medical help right away if any of these very serious side effects occur: frequent/severe headache, fast/slow/irregular/pounding heartbeat, chest pain, neck stiffness/soreness, severe nausea/vomiting, sweating/clammy skin (sometimes with fever), widened pupils, sudden sensitivity to light (photophobia). This medication may increase serotonin and rarely cause a very serious condition called serotonin syndrome. The risk increases if you are also taking other drugs that increase serotonin, so tell your doctor or pharmacist of all the drugs you take. Get medical help right away if you develop some of the following symptoms: hallucinations, unusual restlessness, loss of coordination, fast heartbeat, severe dizziness, unexplained fever, severe nausea/vomiting/diarrhea, twitching muscle. 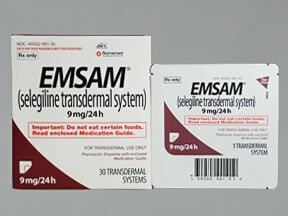 List Emsam Patch, Transdermal 24 Hours side effects by likelihood and severity. Before using selegiline, tell your doctor or pharmacist if you are allergic to it; or if you have any other allergies. This product may contain inactive ingredients, which can cause allergic reactions or other problems. Talk to your pharmacist for more details. Before using this medication, tell your doctor or pharmacist your medical history, especially of: a certain kind of adrenal gland tumor (pheochromocytoma), cerebrovascular disease (e.g., stroke), heart problems (e.g., congestive heart failure, heart attack), personal or family history of high blood pressure, history of severe/frequent headaches, personal/family history of mental/mood disorders (e.g., bipolar disorder, depression, schizophrenia), liver problems, certain nervous system diseases (Parkinson's syndrome, seizures), overactive thyroid (hyperthyroidism), personal or family history of glaucoma (angle-closure type). Avoid exposing your skin to direct heat sources such as heating pads, electric blankets, heat lamps, saunas, hot tubs, heated water beds, or prolonged direct sunlight while wearing your selegiline patch. Heat sources may cause more drug to be released into your body, increasing the chance of side effects. Before having surgery, tell your doctor or dentist you are on this medication. You may need to stop using this drug beforehand. Follow your doctor's instructions carefully. What should I know regarding pregnancy, nursing and administering Emsam Patch, Transdermal 24 Hours to children or the elderly? Some products that may interact with selegiline include: antidepressants (including bupropion, maprotiline, mirtazapine), other MAO inhibitors (isocarboxazid, linezolid, methylene blue, moclobemide, phenelzine, procarbazine, rasagiline, safinamide, tranylcypromine), appetite suppressants (such as diethylpropion), drugs for attention deficit disorder (such as atomoxetine, methylphenidate), apraclonidine, buspirone, carbamazepine/oxcarbazepine, cyclobenzaprine, deutetrabenazine, certain herbal products (such as ephedra/ma huang), cold medications/nasal decongestants (such as phenylephrine, phenylpropanolamine, pseudoephedrine), fentanyl, street drugs (such as LSD, mescaline), stimulants (such as amphetamines, ephedrine), supplements (such as tryptophan, tyramine), tetrabenazine, certain "triptans" used to treat migraine headaches (such as rizatriptan, sumatriptan, zolmitriptan), valbenazine. It is very important that you follow special dietary restrictions in order to limit the amount of tyramine in your diet if you are using the higher strength patches (9 or 12 milligrams). Avoid drinking large amounts of beverages containing caffeine (coffee, tea, colas) or eating large amounts of chocolate. Caffeine can increase the side effects of this medication. Foods and beverages high in tyramine should be avoided while you are using this medication and for at least 2 weeks after you stop using this medication. Moderate-to-low tyramine content foods include: alcohol-free beer, avocados, bananas, bottled beer and ale, chocolate and products made with chocolate, coffee, cola, cultured dairy products (e.g. buttermilk, yogurt, sour cream), distilled spirits, eggplant, canned figs, fish roe (caviar), green bean pods, pate, peanuts, port wine, raisins, raspberries, red plums, spinach, tomatoes, white wine. Does Emsam Patch, Transdermal 24 Hours interact with other medications? Should I avoid certain foods while taking Emsam Patch, Transdermal 24 Hours? Laboratory and/or medical tests (e.g., blood pressure) should be performed periodically to monitor your progress or check for side effects. Consult your doctor for more details. If you miss a dose, use it as soon as you remember unless it is close to the time for your next dose. In that case, skip the missed dose and resume your usual dosing schedule. Do not apply 2 doses to catch up. Store at room temperature away from light and moisture. Do not open the foil pouch until you are ready to use the patch. Do not store in the bathroom. Keep all medications away from children and pets. Do not flush medications down the toilet or pour them into a drain unless instructed to do so. Properly discard this product when it is expired or no longer needed (See How to Use section).Information last revised June 2017. Copyright(c) 2017 First Databank, Inc.
Are you taking Emsam Patch, Transdermal 24 Hours? Are you considering switching to Emsam Patch, Transdermal 24 Hours? 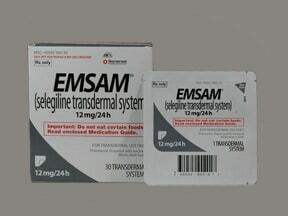 How long have you been taking Emsam Patch, Transdermal 24 Hours?